THE DB Sports Tours Small Sided Games Summer Cup is almost here and we can unveil the exciting group lineups and fixtures in each section. Next weekend (August 3rd and 4th) will see some of the best Small-Sided-Games players in the country converge on VEC Football Club in South Dublin for the groundbreaking event. Last month we even revealed that the Dublin District Schoolboy League’s exciting changes to their small-sided games and Under-12 sections for the coming season will be incorporated in the tournament ahead of the season’s big kick-off a month later. 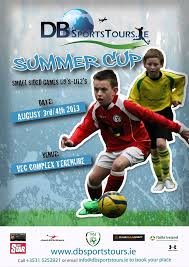 The Summer Cup is the first of it’s kind small sided games tournament in Ireland and if the lineups and fixtures are anything to go by it will be unforgettable. In the Under-9 section St Francis FC 1, St Kevin’s Boys, Naas AFC, Malahide 1 and Belvedere will clash in Group 1, while St Kevin’s Boys are also in Group 2 alongside Malahide United, Cabinteely and St Francis 2 and the local Royal Blue’s Crumlin. 2. Group Two sees St Kevin’s Boys, Naas, Ardee Celtic and Belvedere lock horns and finally in Group Three of this mouth watering age group we see Cabinteely Boys, Palmerstown FC, Crumlin United and ST.Francis 3 battle it out to become the DB Sports Summer Cup U10′s Champions. The Under -11 section sees Group One St Malachys, Drumfinn Celtic, Home Farm, Knocklyn United and ST.Kevins 2. Leixlip United, St Kevin’s Boys 1, Palmerstown FC, ST.Kevin’s 1, Naas AFC from the Kildare School Boy League, Rock Celtic from the Dundalk Schoolboy Leage and newly promoted from the DDSL Leixilp United face off in Group 2. Finally the Under 12′s is the one we have all been waiting for – Group One – ST.Francis winners of the DB Sports Manchester Easter Cup, ST.Kevins 1 last seasons Under 11 DDSL Premier Winners, Malahide United 2 and Crumlin United 2. Group 2 sees ST.Kevin’s 2, Knocklyn United 1, Alan Doyles Crumlin United 1 and Enfield Celtic from the North East Counties. Finally in this competitive age group we have in Group 3 Mike Geoghegan’s Naas AFC, local side Knocklyn United 2, Castleknock Celtic and Malahide United 1. Some absolutely cracking sides on show over the weekend, this action is not to be missed. Best of luck to all coaches and players participating over the weekend.